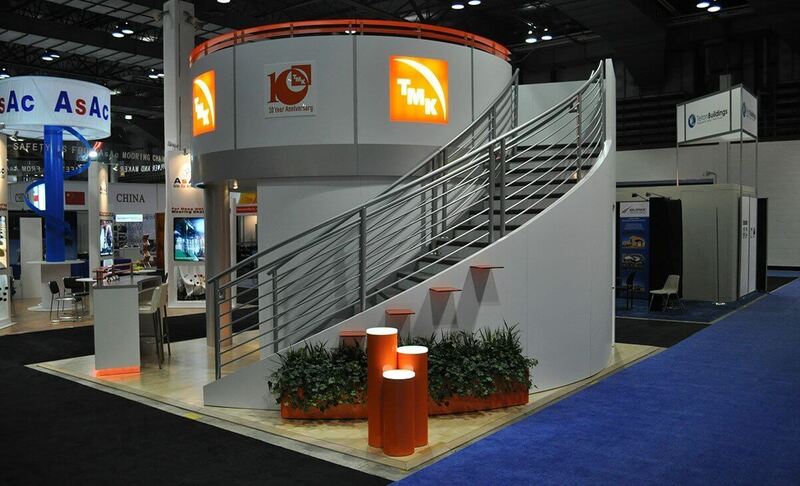 TMK was celebrating its 10 year anniversary at this event and requested a two-story booth for a 20×20 island space. TMK wanted to show samples of its product and also required an area for hospitality, food and beverage service, and seating. The booth location was not the most favorable, so visibility from all directions was important for attendees to find them. Exhibit Network designed and fabricated this exhibit first and foremost to display TMK’s product samples. Although the products are not shown in the photo, there were 12 areas to hold samples, including the three orange cylinders front and center of this photo and the four orange shelves immediately above the plants. Around the corner were recessed display cases with LED accent lighting to hold more product samples. The booth amenities included a full-size refrigerator, greeting counter, lockable storage closet, and an overhead sign for visibility (not pictured). The upper section featured a full-service bar with bistro seating for guests.